This was a commission, designed and made for a young woman, as a gift from her parents, to mark a significant birthday. 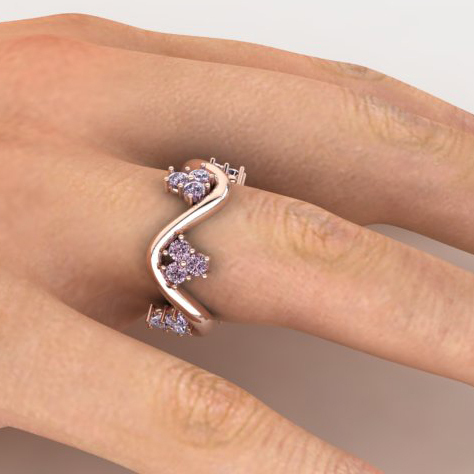 The bespoke ring, with pink sapphires on a gently curving band was chosen by the daughter, from a page of unique designs that we produced for her. We listen carefully to the preferences that each client tells us and then create a page of water colour illustrations, from which the customer can choose. No two clients are ever the same, so we pride ourselves in original solutions for every inquiry. Our lady wanted something very pretty and delicate. She was attracted to flowers and general ‘organic’ shapes. (No straight lines and hard forms wanted.) We happened to have been offered first refusal on a packet of small padparadscha sapphires. These rare gems are a soft, rhubarb-pink colour (which isn’t done justice, in the photo!) We grouped them together in little clusters of three, creating floral ‘splashes’ to punctuate the wave. Sapphires come in every colour, except red (when they are classed as rubies!) All sapphires and rubies are in the corundum group of minerals. Different elements within the corundum influence the colour of the gem. Blue sapphires have iron and titanium content within the mineral. Pink has chrome, violet has vanadium and yellow and green sapphires have small quantities of iron present. Sapphires are a great choice of gem for rings, as the corundum family of minerals are second hardest after diamond; therefore having good wearing properties.